Six 1.2 oz. 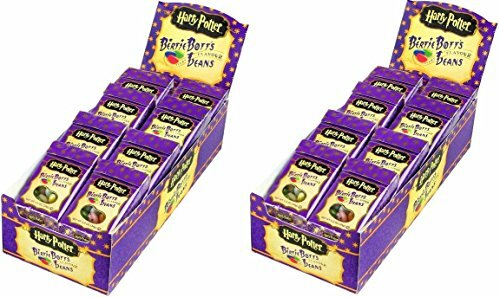 boxes of Harry Potter Bertie Botts Every Flavor Beans by Jelly Belly. The Original Gourmet Jelly Bean, Since 1976. Approximately 30 beans per box. New packaging coming soon; Same great taste just a new look!You can tell a hard boiled egg from an uncooked one by spinning it on a counter top, but that isn't going to help you here. Become a risk taker, or, at the very least, a student of subtlety as you attempt to divine which Bertie Botts Every Flavored Beans are tasty and which of them are totally disgusting. They come in 20 flavors. First, the ones you might expect: Banana, Blueberry, Cherry, Cinnamon, Candyfloss, Green Apple, Lemon, Marshmallow, Tutti-Fruitti, and Watermelon. 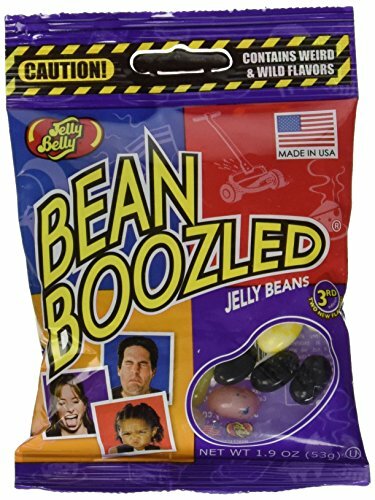 Second, the flavors that make Every Flavored Beans different than ordinary jelly beans: BLACK PEPPER, BOOGER, DIRT, EARTHWORM, EARWAX, GRASS, ROTTEN EGG, SAUSAGE, SOAP, AND VOMIT. Like a steakhouse that leaves half the meat out in the sun, you have a 50/50 chance of tasting something you donÕt want to. Go ahead and play a little candy Russian Roulette. 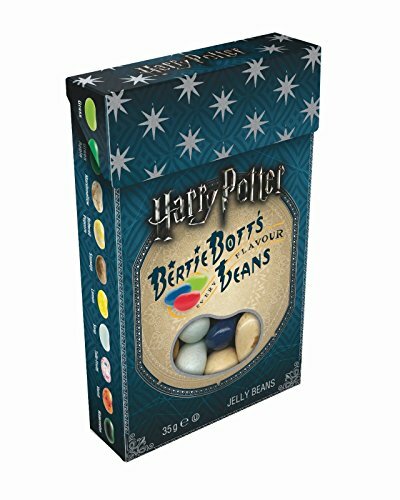 It's the return of the infamous Bertie Bott's Every Flavour Beans! Delicious "normal" jelly beans are mixed with crazy, creepy flavors in a 20-flavor magical medley! Boxes are randomly assorted and may not contain every flavor. 20 different flavor mix may include: Banana, Black Pepper, Blueberry, Booger, Candyfloss, Cherry, Cinnamon, Dirt, Earthworm, Earwax, Grass, Green Apple, Lemon, Marshmallow, Rotten Egg, Sausage, Soap, Tutti-Fruitti, Vomit or Watermelon.Jelly Belly jelly beans are vegetarian friendly, do not contain gluten, peanuts, dairy, fat or gelatin, and are certified OU Kosher by the Orthodox Union. 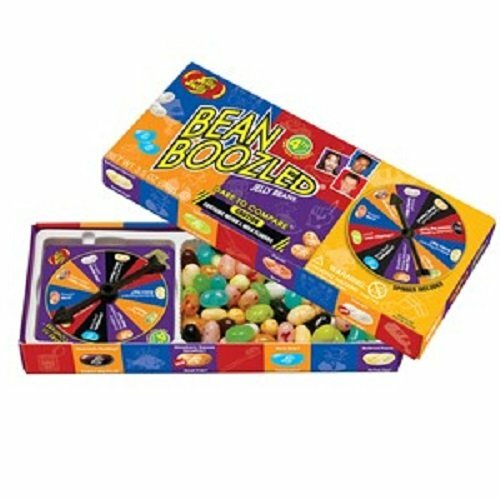 "BeanBoozled jelly beans come in 20 flavors, 10 weird and wild flavors matched up with 10 look-alike tasty flavors. Is the white bean Spoiled Milk or Coconut? Perhaps the blue bean is Toothpaste flavor, or maybe its delicious Berry Blue. You might not know when you will be bamboozled by a weird flavor. A key on the back of each box gives clues to the surprises found inside, but the beans look so similar, every bite will be a surprising dare. You can tell a hard boiled egg from an uncooked one by spinning it on a counter top, but that isnÕt going to help you here. 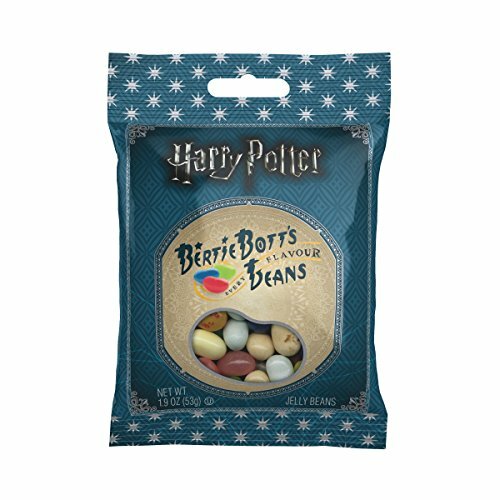 Become a risk taker, or, at the very least, a student of subtlety as you attempt to divine which Bertie Botts Every Flavored Beans are tasty and which of them are totally disgusting. They come in 20 flavors. First, the ones you might expect: Banana, Blueberry, Cherry, Cotton Candy, Green Apple, Lemon, Marshmallow, Tutti-Fruitti, and Watermelon. 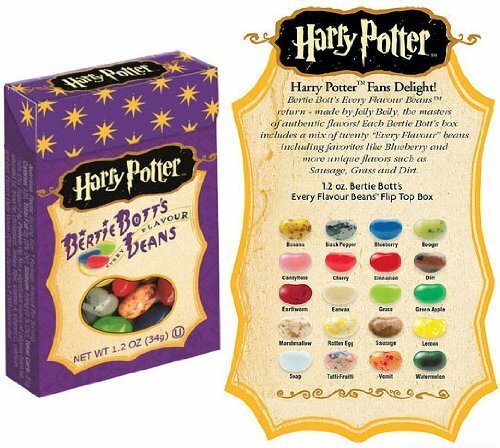 Second, the flavors that make Every Flavored Beans different than ordinary jelly beans: BLACK PEPPER, BOOGER, DIRT, EARTHWORM, EARWAX, GRASS, ROTTEN EGG, SAUSAGE, SOAP, AND VOMIT. Like a steakhouse that leaves half the meat out in the sun, you have a 50/50 chance of tasting something you donÕt want to. Go ahead and play a little candy Russian Roulette. 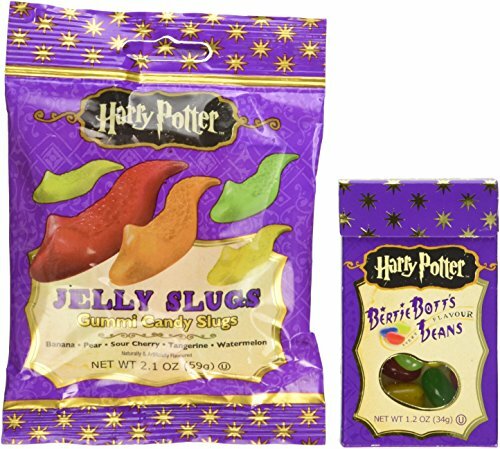 Jelly Belly Harry Potter Slugs - 2.1 oz. 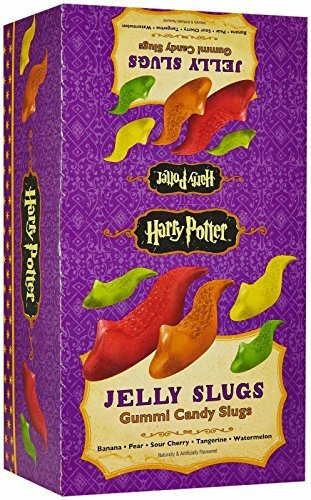 Copyright © Wholesalion.com 2019 - The Best Prices On Harry Potter Jelly Belly Online.